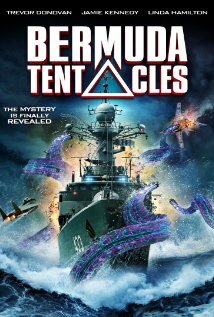 BERMUDA TENTACLES deals with a fleet of Navy warships that encounter some bad CGI creatures enroute to rescue the President of the US (John Savage), who's trapped on the bottom of the ocean floor after his Air Force One went down during a lightning storm. Past-her-prime Linda Hamilton (THE TERMINATOR) and never-hit-his-prime Jamie Kennedy headline a cast that look like they would rather be off drinking in a local bar. This water logged mess is available for streaming on Netflix, VUDU, and Amazon Instant Video, but as always, you're better off leaving the sci-fi tropes checklist to us and watching something more highbrow like James Cameron's 1989 underwater masterpiece, THE ABYSS, instead.